Games catering for the incurable romantics out there in slots land are aplenty, it seems. Whether it's the drama of Immortal Romance from developer Microgaming, with its in-depth literary theme and intuitive gameplay, or the late-night luxury of The Finer Reels in Life, also from Microgaming, slots designers seem to adore getting all loved up. Microgaming have thrown their rose into the ring once again here with a 5 reel, 30 pay-line slot that takes us back to a classic Victorian romance. Starlight Kiss is chock full with rose bushes, gas lamps, gold carriage clocks, and 10-through-Ace symbols all presented in a swirling typeface. Has Mills and Boon started designing slots or something? Elsewhere there are choccies, posh hotels - perfect for a romantic weekend away - and our airbrushed couple kissing. Inevitably, the background music is schmaltz all the way, but when you've got a slot called Starlight Kiss, what do you expect? The Starlight Kiss logo acts as the game's Wild, and substitutes for all symbols other than the Scatter and bonus symbol. The Scattered mansion symbol triggers 14 free spins when three or more appear across the reels. All wins are doubled, and freebies can be re-triggered. The star-crossed lovers icon triggers the main Romance Bonus when appearing on reels 2, 3 and 4. Essentially a Pick Me Bonus game, you'll be presented with a lovely garden scene packed with items. Simply pick items to reveal bonus prizes. There are also hearts to be won. The more hearts you pick, the greater the multiplier that applies to the prize. 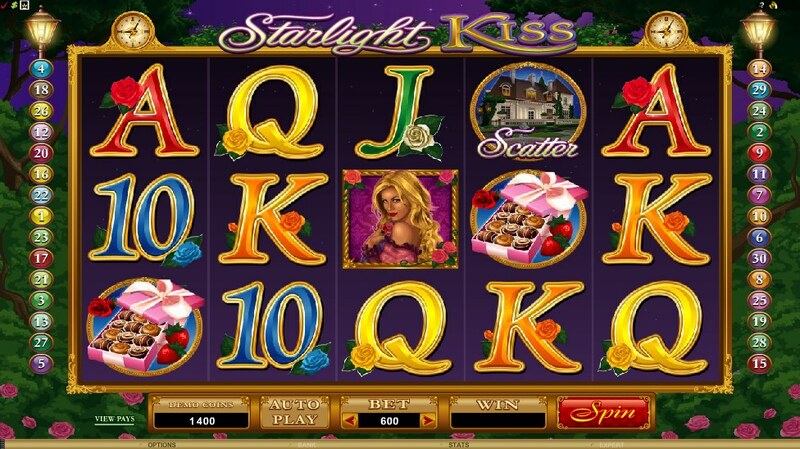 With generous free spins plus a Pick Me game that can reap nice rewards, Starlight Kiss is perfect for a quick Valentine's Day play online. And at 30 pay-lines with a $0.01 minimum bet, it won't break the bank either. This is definitely one of those chilled-out affairs that proves to be a nice change to the bang-bang slots you normally get.